Yoga ON Earth (YOE) is part of Dhirata Yoga and mj_yogalife; it is all about bringing yoga out onto the earth, into our lives. I have noticed during 27years of teaching that a lot of folks come to a class, love the stretch and relax, feel amazing and then roll it up in their mat until the next class. That next class might be only a day or two away, a week away, or for some only when they can get time away from work, commitments, study, children, parents, pets whatever gets in the way of us making time for 'self'. So in the mean time all that lovely yoga energy is rolled up in a mat, in the boot of a car, in a cupboard, on the floor in the garage, laundry…wherever. 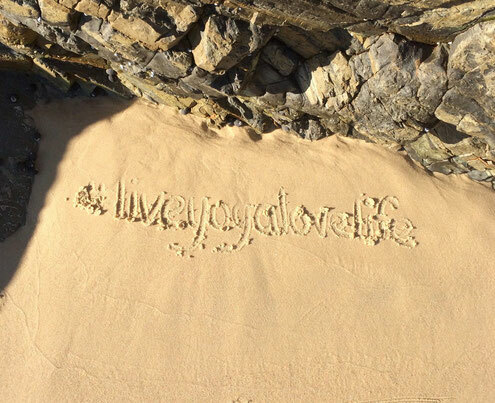 It is not utilised, it is just given a bit of thought about how much we love yoga, love our teacher, love the whole idea….but we are not loving our selves enough to roll out the mat when we have 5 minutes or 10 minutes or 1 hour. We get a little caught up in having to have a whole 1.5 or 2hrs to practice properly, which frankly for most of us is an impossibility. So bear with me as I set the scene. I wake in the morning, early…as the kookaburras laugh their way into a new day. I have had a pretty ordinary sleep because ……….. (of various reasons) so I just want to roll back over and go back to sleep. I lie awake (sort of) and think about what I have to do today, what I would like to do today…included in what I would like to do today is to stretch out my tired body, rest my mind from the daily diatribe that is rushing through my head like a freight train and find some peace inside so that I can be present in my life and not just a passenger on the ride. So I throw the sheets off and place my feet on the floor…because thats what I want to do. Once in my yoga space, I can either lie down and relax, I could even go back to sleep, I can lie over a bolster, I can breath, meditate, procrastinate, think, not think, massage, move fast, move slow…its my time it is my relationship with me and it matters. It makes my day, my week, my life more meaningful and it enables me to cope, actually more than cope, it means I am choosing to live my life on my own terms. Yoga is my peace and my piece of time for me, with me. So YOE is really about being yoga not just doing yoga. It is getting out by yourself, with a friend, with a group and making a difference through self nurture, self monitoring, being mindful about your life, how you move, what you think, what you eat, how you breath. Its not about turning up to a class and going through the 'yoga moves', frankly almost anyone can do that, but few can really live from a place of peace inside, the kind of peace that comes from making peace with yourself. It is a work in progress and its not easy to remain present, especially when the tough stuff arises, from outside or from within. YOE this year is focusing on two treks to Nepal. Trekking is a passion of mine and helps me to find my peace in nature with nature. Nepal is one of those beautiful places that expands our awareness from the clutter, smog and unbelievable busyness of the cities to the majestic, pristine and quiet mountains. From the jungles to the lakes and the extreme weather changes. But one of the most enlightening parts of being in Nepal is the people. They are so special, they are mostly people of Sattwa, that live simply, by the laws of nature, by love of family, there needs are small and their hearts are big. They smile the widest smiles and they open their homes and villages to trekkers and travellers and never complain and always try to make sure that we have the nicest, warmest experience while we are in their country. Nepal trekking combined with yoga is a guarantee to change your life. So if you are looking for a change, an adventure, a holiday that holds meaning, then you are in the right place. Daily yoga practice helps to keep us mindful, stretch out tired muscles and prepare us for the day to come. Remember how you feel when you walk out of a yoga class, imagine feeling like that as you wander through the highest of high mountains. Surrounded by 8000m peaks caped with snow, birds, donkeys with jingling bells carrying their cargo through the mountains, little kids singing out 'Namaste' whenever they see you coming, gorgeous big Himalayan Trek dogs joining us for a trek through to the next village. And I nearly forgot to mention the Rhododendrons that cover the mountains in reds, pinks and whites. It is bliss and will be indelibly imprinted in your heart and mind for many years to come. Join me you won't be disappointed.